生日快樂 – Happy Birthday, Hubby! Boy, oh boy. 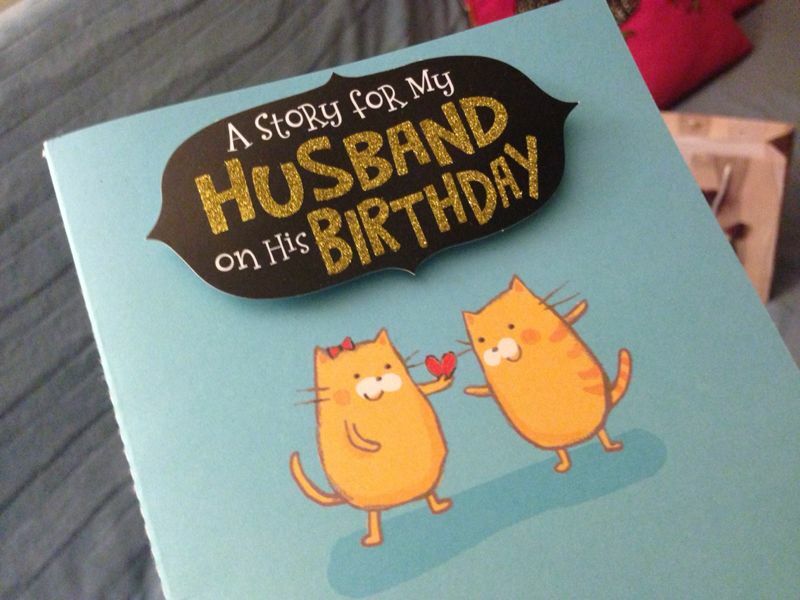 It’s THAT time of the year – my husband’s birthday. 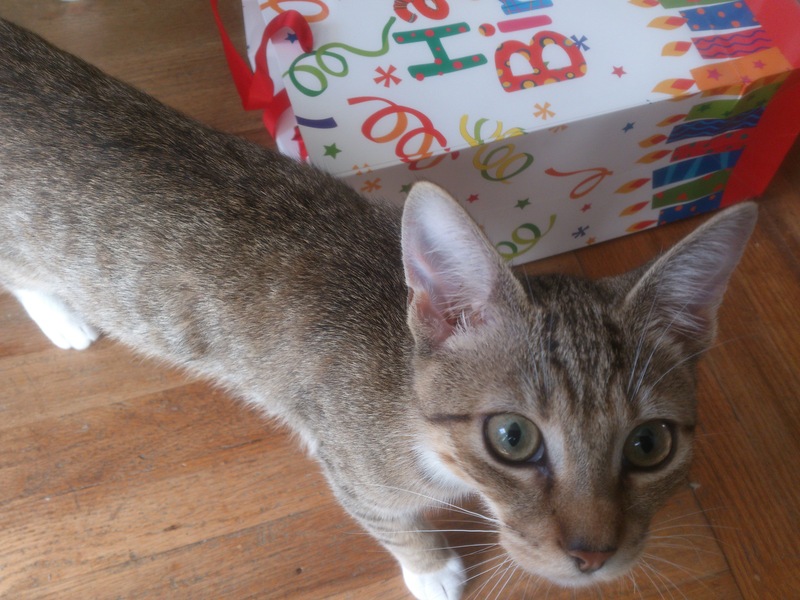 I don’t often share with my readers or random people with our private life, but since those birthday are really special, and you as my readers are special to me as well, I want to share our first birthday TOGETHER. Sad thing about long distance relationships is you cannot always be there when partner needs you or just wants to be with you.My birthday are in May, his in November so because of school etc. we couldn’t spend them together.It was just sending cards and gifts with ‘romantic Skype-chat’. This year I could make it like he never had. I mean it’s not hard when your partner was brought in a family that doesn’t really celebrate literally anything. Chinese New Year, birthday, whatever – just doesn’t matter. 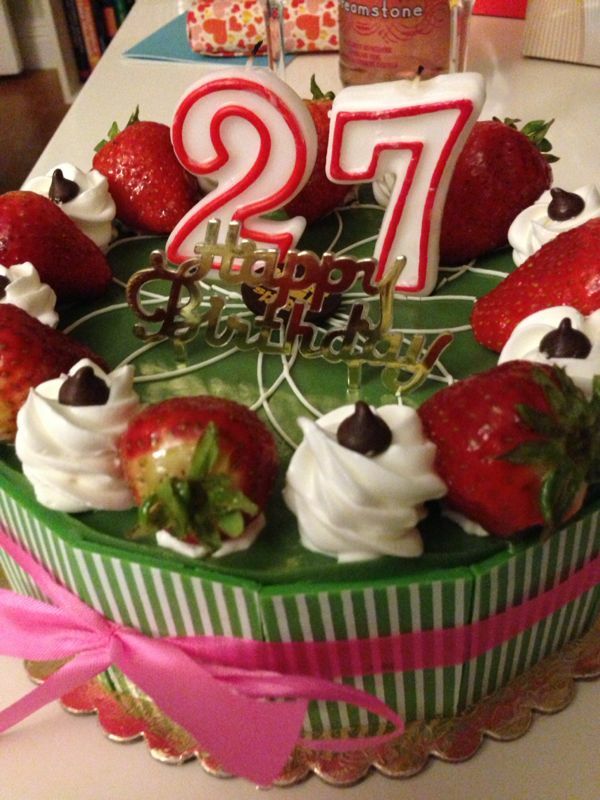 To be honest last year when I was in Hong Kong I got a birthday cake for his mom and it was the first time in her life someone actually celebrated her day. And now I’m doing same for him – even thought his birthday are on 10th of November (Sunday) I had to do a surprise today… otherwise it wouldn’t be a surprise with him at home! On a tight budget with clipper (something like Octopus card in Hong Kong) I went thru Target, Dollar Tree, Daiso, Macy’s and bakeries all around East Bay. First I started with decorations: I got a birthday sign on a wall in Daiso and a cute big gift bag. Biscuit used it as her’s – she put herself there, since she’s the best gift he could got. Damn, I should put myself in that bag. 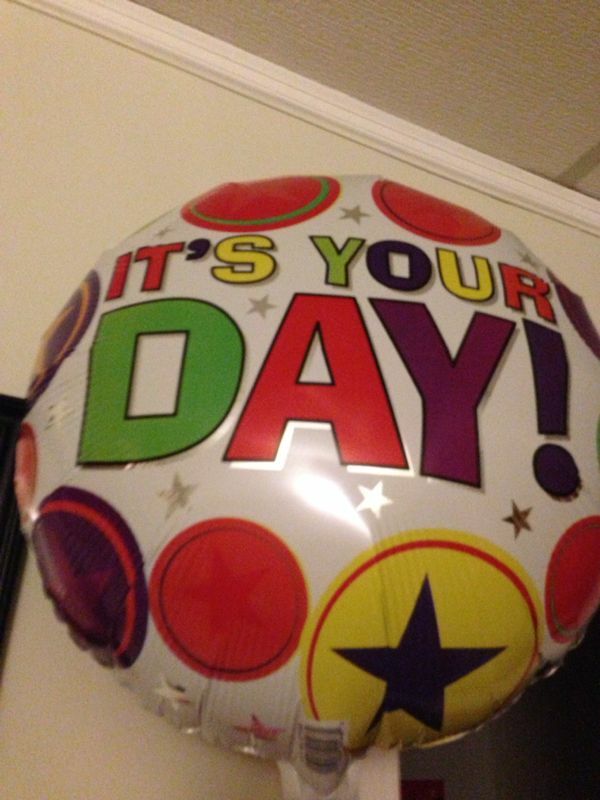 With a balloon I had to wait until today’s morning to get it from a Dollar Tree. Sing doesn’t really pay attention to what is going on around him but I’m pretty sure that even he could notice a ballon flying across the room. 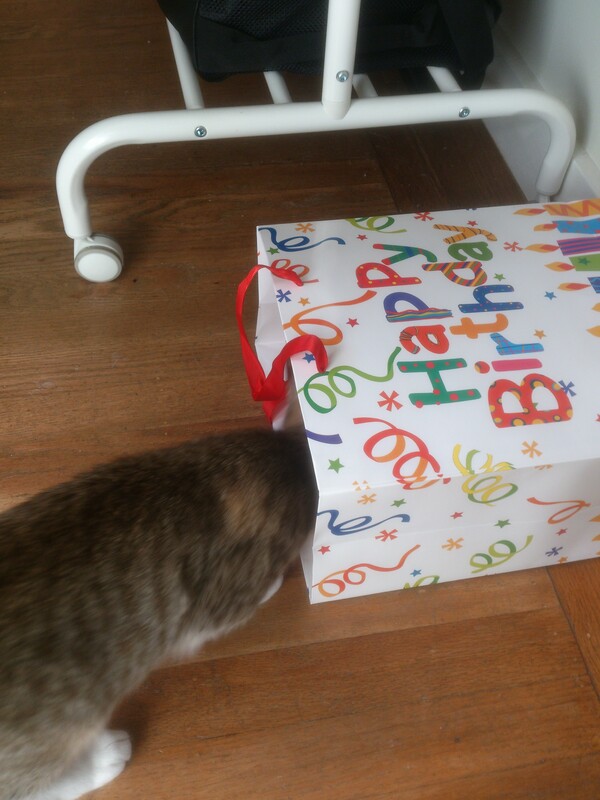 But I think the one who is really happy from the birthday balloon is actually Biscuit – she got crazy with a string and runs with it across the house. I had to tight it to the shelf but she still tries to steal it. Beside that Dollar Tree (not really dollar if you count it with a tax, haha) provided us a cute pink hats! 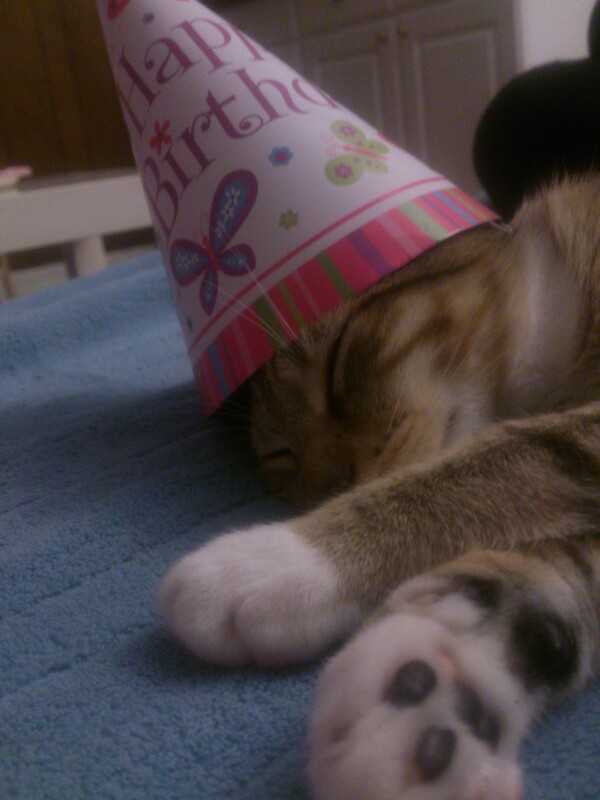 Since Biscuit was so tired with (not) her balloon I was able to make her a party-cat and put one on her head. Am I becoming a crazy cat lady or she just looks adorable? Next thing I had to take care of were drinks and noms. 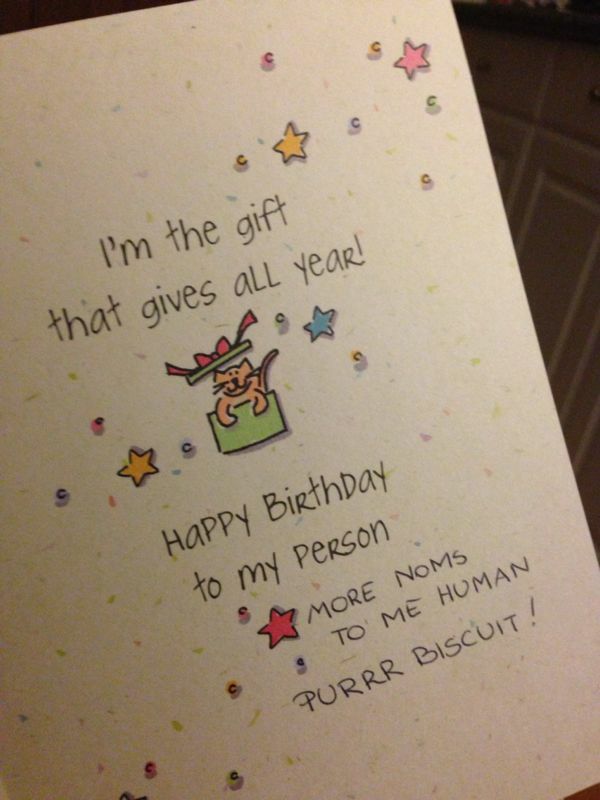 And by noms I mean cake. For drinking I got simple: I don’t really drink alcohol so I took cute, pink and cheap – DreamStone Pink Moscato. I must say it’s not bad – at the beginning it’s sweet then it changes to taste of alcohol. My husband finished half of it while playing Battlefield after our little party. But cake was much more difficult task. Why? Because there’s no bakery making onion-garlic cake sparkled with green onion and ginger. He hates chocolate so I thought of some more-Asian cake. I remembered that Sheng Kee Bakery had a cake that could suit his taste. 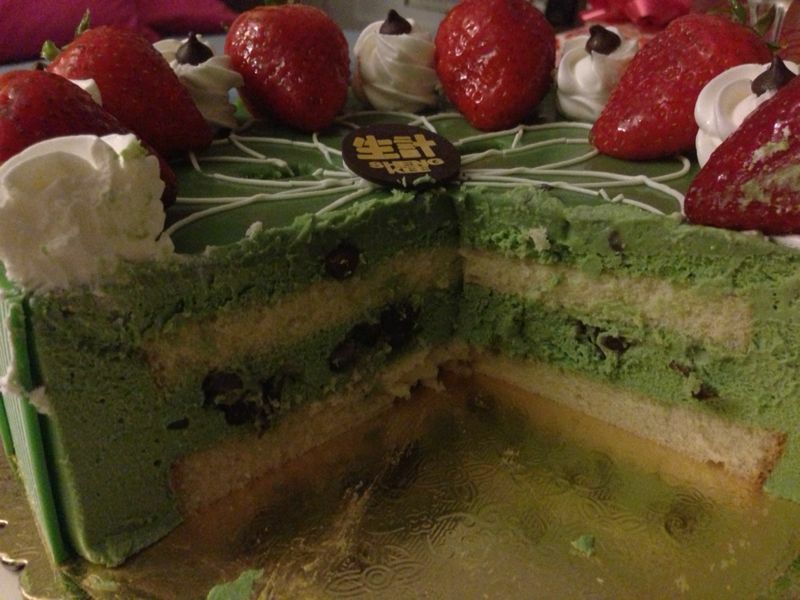 It was a green tea red bean cake with little bit of cream and strawberries. It wasn’t too expensive – with milk tea and tax I paid less than 27 USD. For me personally it was horrible but I’m not really a fan of that kind of cakes, but my husband really loved it. We shared it with our landlord and a girl living next door. Biscuit was the only one who shared my feelings about the cake – she sniffed it and run away. To the cake SKB also adds a golden ‘Happy Birthday sign’ if you wish. 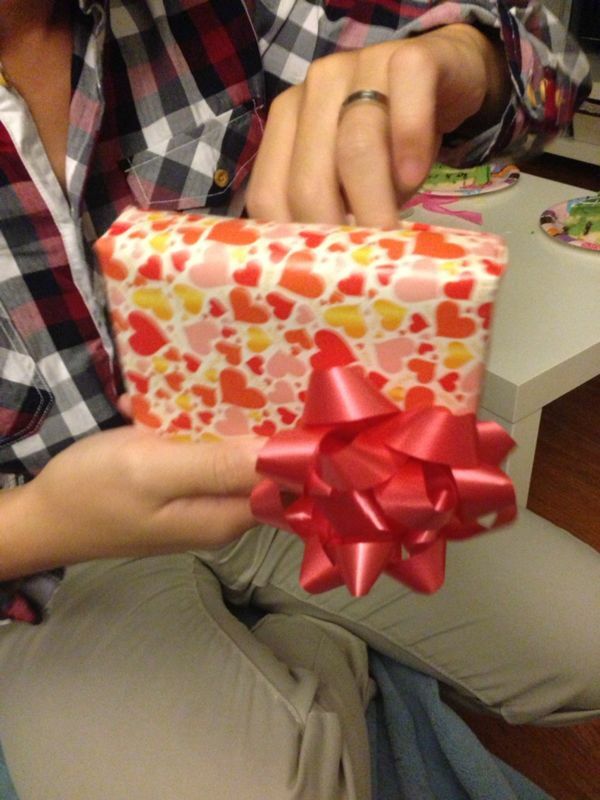 The last and probably the most important thing I had to take care of were gifts. 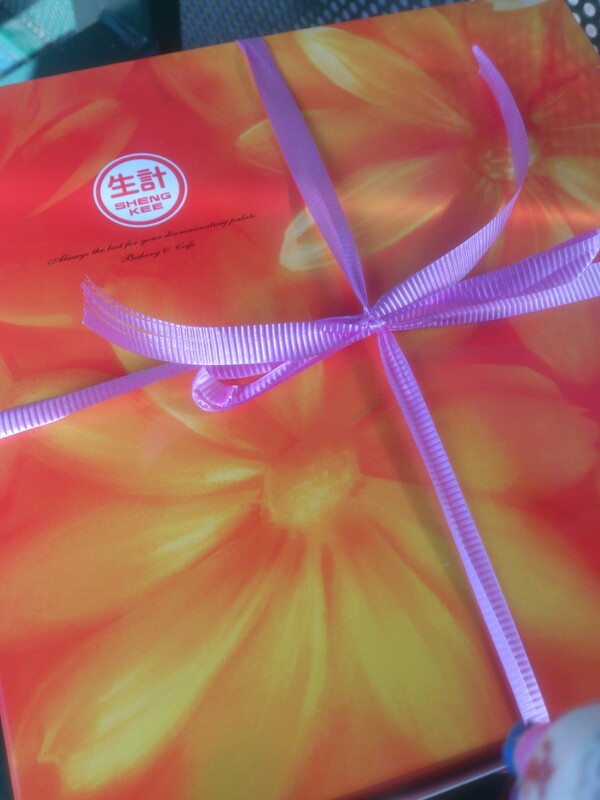 One of the gifts was sent by my parent’s long time ago – with a postcard he got a really nice shirt, although European size is too big for my Tiny Hong Kong Man. From Biscuit I just had to buy that adorable postcard ‘from kitty to owner’ – it just shows everything she would like to tell my husband, I guess. From myself I got him Tommy Hilfiger’s wallet because his old one looked like it was used by his great great great grandfather. Macy’s is an outlet with some good brands and I think when my husband heard how much % it was off he got happier than from actual gift. When I told him ‘It was 40% off’ he had a huge smile at his face, later he said it makes the gift more attractive than if it was for a full price. Being cheap for yourself on your own birthday – achievement unlocked. Just to show off – he asked me did I pay or got offered to pack the wallet for me. That means I packed it so well he thought it’s professional work. On the other hand he draws a cat as big as a tree so it might not really be a compliment. And now I want to wish you, via this blog I know you read, my dear Hong Kong husband ahuge fortune, a good health until you get 120 (at least), a lot of happiness with small things in your life (like stabbing people from the back in Battlefield and laugh from it like you were 10 years old). I wish you good food because eating is also a pleasure. I hope no sadness will come around you. I don’t wish you get along with Biscuit, I actually wish she will dislike you. On the top of that I want to say that I won’t wish you love because you have love from me, our families, from friends. 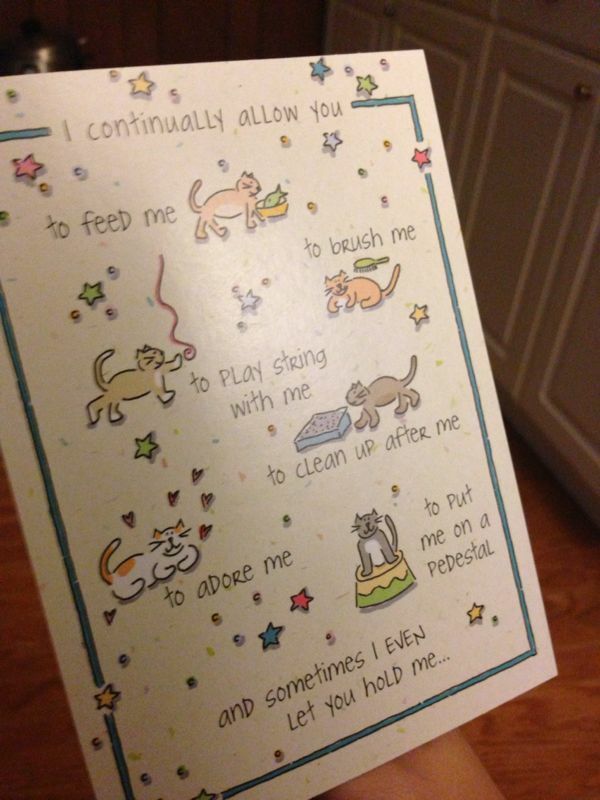 Sometimes even from the cat. That’s not what you need or want anymore. I don’t need to say how much I love you, you know it well. Just keep on living and let’s get old together – to make you feel better your wife will always be 5 years younger than you. When you get 60 you still can say you’re having a foxy lady in her 50’s. I know no one here really knows him but could you wish him something? Even ‘Happy Birthday’ counts! More wishes better it gets! Thank you, MHKH-readers for being with us on this special weekend! 3 days-celebration, here we go! I haven’t spent any birthdays together with my girlfriend yet. We’ve been long distance for 5 years and counting! Thanks for sharing your experience, it’s something to look forward to. Sounds like your planned a great surprise for your husband!! Enjoy your weekend to the fullest! Also a Happy Birthday from me. You planned a great party for your husband. I’ll bet you had as much fun as he did. Wishing him a happy birthday. 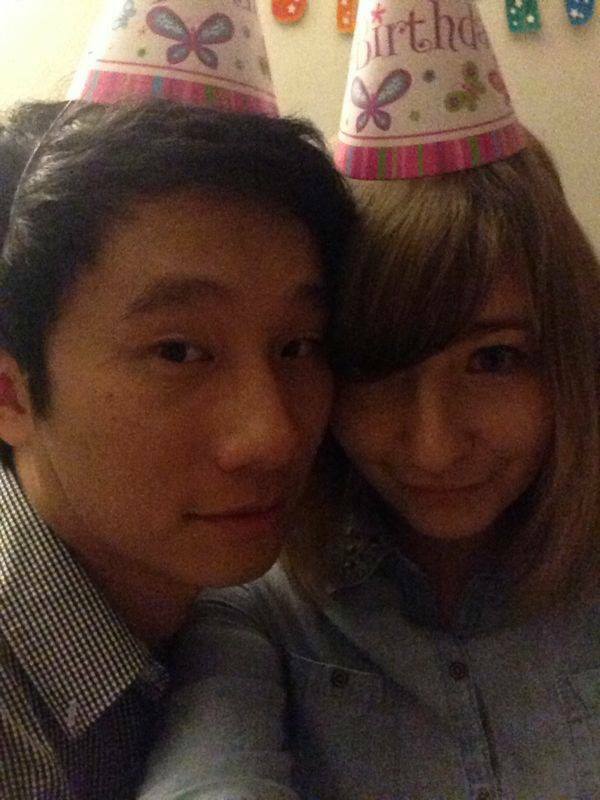 Happy Birthday to the Hong Kong Husband! i too know how hard to maintain a long distance relationship. thumbs up for you (Y). Wishing a very good (a bit belated I know…) birthday and a year filled with laughter, fun, friendship and love! Pls send a happy birthday to my fellow Scorpio! 😀 Tell him that he’s lucky having a very attentive wife.. You guys definitely had a great time! Happy Birthday, Hubby! It sounds like your wife threw you a wonderful party. I hope you enjoyed it. How could you not? Belated “Happy 27th Birthday” from the USA. Well, I’m a little bit late, well, Happy Birthday, Hubby! Wish you happy forever! reading this posts made me really happy because I think asian men are all alike. My husband makes the same discount comments and laughs at the same stuff when he plays his video games (like when he finds a blind spot where he can shoot people and they cannot figure out how they died). Hope you and your hubs stay happy for a long time!